In other words, the spending plan would include some immediate budget relief in the next year or two. But beyond? A much different story – both debt and deficit would spiral to unprecedented levels. Federal debt already puts each American household on the hook for $124,000 and $56,378 per person. With the U.S. Debt currently more than $18 trillion and counting, Job Creators Network is concerned about piling more spending on a budget that is already unsustainable. And new data from the Congressional Budget Office (CBO) shows that concern is well-founded. On January 26, 2015, the Congressional Budget Office (CBO) released its budget and economic outlook, which specifies budget and economic projections for the next ten years. Below are highlights from the report. Read a more in-depth analysis from the Committee for a Responsible Federal Budget here. Declining deficits will be short-lived. The federal budget deficit is forecast to be just under $470 billion this year and next, but will rise to $489 billion in 2017 and continue growing indefinitely thereafter. Trillion dollar deficits are coming back. Deficits will rise from $483 billion in 2014 to $739 billion by 2020 and nearly $1.1 trillion by 2025. Debt will hit $20 trillion. 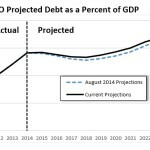 As deficits rise, so will the national debt, with public debt rising from $13 trillion today to $16.6 trillion by the end of 2020 and $21.6 trillion by 2025. Debt to GDP will remain at record highs in the near term. The debt has more than doubled as a share of the economy since 2007 to 74 percent of GDP, and will remain there through 2020. This is the highest the national debt has ever been other than around World War II. Future debt levels will grow unsustainably. Debt will rise quickly after 2020, from around 74 percent of GDP to 79 percent by 2025 and will continue to grow indefinitely thereafter. 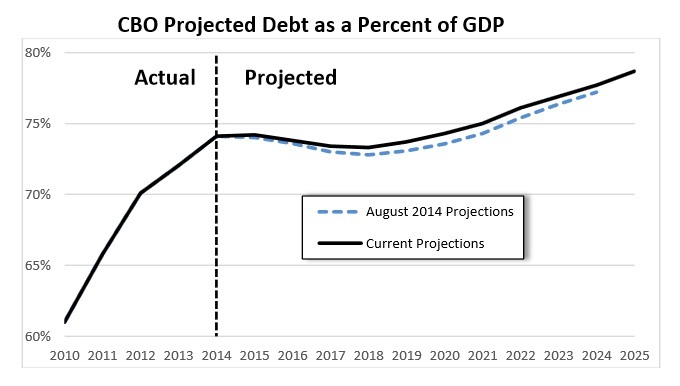 Rising interest costs and entitlement spending will drive debt growth. Despite cuts to the discretionary budget, overall spending will rise by 2 percent of GDP through 2025 – to 22.3 percent of GDP – as Social Security, health care, and interest continue to grow faster than the economy. Meanwhile, revenue will remain roughly flat at around 18 percent of GDP.